Quantum computing is based upon quantum properties of matter, like superposed and entangled states. It has been shown recently that point defects in solid may be considered as relevant elementary quantum systems in this frame. At INSP, the ‘Couches Nanométriques : Formation, Interfaces, Défauts’ team has achieved the identification of a very promising defect in silicon carbide, a mature semiconductor which has already many applications in microelectronics. This defect is called NV center and is formed by a nitrogen – silicon vacancy complex (N is used as a dopant atom in SiC). 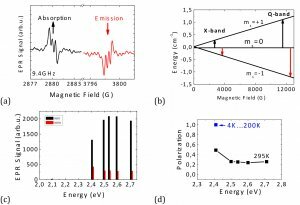 The team has determined by electronic spin resonance under optical excitation, the magneto optical properties of this defect and experimental results have been compared to theoretical calculations made in collaboration with the university of Paderborn (Germany) to establish the defect structure, at the atomic scale. Point defects in solids can be viewed as isolated quantum system with a non-zero intrinic magnetic moment (their spin) originating from the perturbated electronic configuration of the nearest neighbor atoms. The control and manipulation of the spin of the defects by optical mean, at room temperature, has already been achieved for the particular case of the NV defect in diamond. 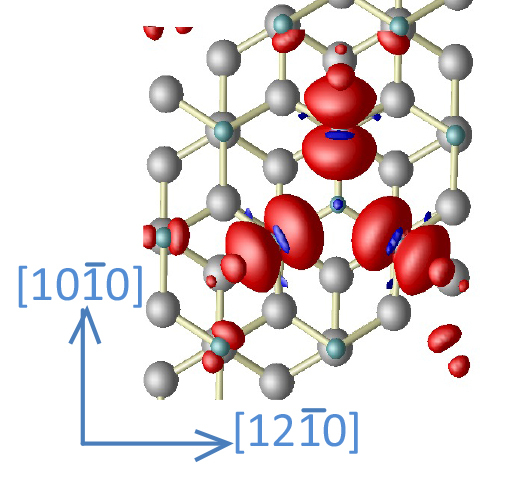 This defect is a carbon vacancy associated with a nitrogen atom. The nitrogen is a frequent impurity in diamond which may also be introduced purposely by ion implantation for instance. This spin S=1 defect may be seen as an isolated artificial atom, stabile and protected from the environment by the crystalline structure of the diamond. Its electronic spin can be manipulated by microwave pulses and optically read out. This defect exhibits a strong and stable photoluminescence at room temperature and consequently is a very convenient single photon emitter for quantum cryptography applications for example. At INSP, we have identified a similar defect in silicon carbide, a material with both fundamental and technological advantages as compared to diamond. On the one hand, as SiC crystallizes in a variety of structures, other point defects configuration in this material are expected to be relevant for quantum computing and spintronic applications and, on the other hand, this material is already technologically and industrially relevant, due to its applications for high frequency and high power devices. 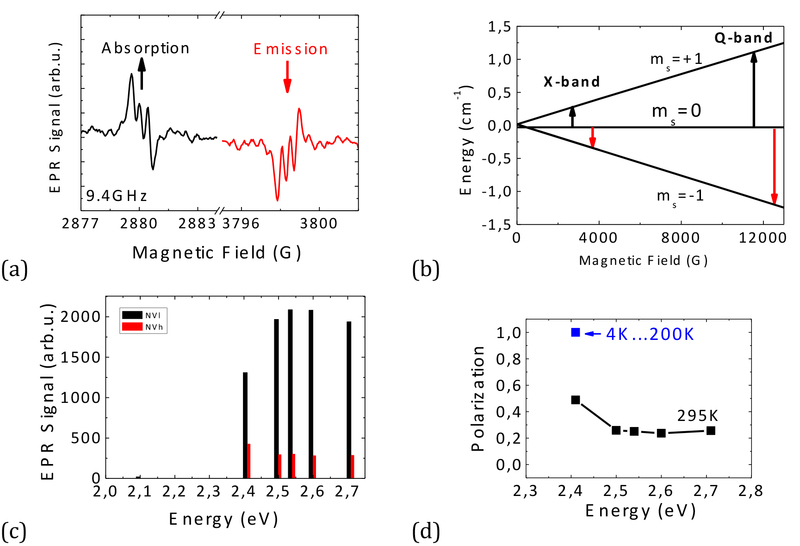 We have been able to identify and to determine the magneto optical properties of the NV center in SiC by electronic spin resonance under optical excitation. Our experimental results have been compared to first principles calculations performed at the university of Paderborn (Germany), in order to establish the atomic structure of the defect. Figure 1 presents the calculated spin density distribution (view along the hexagonal c axis) around the defect. Electronic spin density (paramagnetic electron) around the Si vacancy and N atom of one NV center in 4H-SiC (view along the c () crystal axis)..
We have shown that this center has an optically polarizable S=1 state. The Figure 2a shows the EPR signals of this center observed at 4K under 2.4eV excitation. According to the electronic levels scheme displayed Figure 2b, the signals correspond to two resonant transitions between the Zeeman levels ms=0 and ms=±1. These transitions are observed either in absorption (black) or emission (red) due to the preferential polarization of the ms=0 state induced by the light excitation. This effect should render possible the control of the spin polarization of the defect, facilitating its manipulation for further quantum computing applications. The polarization rate as a function of the optical excitation can be assessed by the intensity ratio of these two transitions. Figure 2c shows these intensities at room temperature for different energies of the optical excitation, revealing a threshold energy of 2.3eV. Figure 2d shows that below 200K only the ms=0 level is occupied whereas at room temperature a partial occupation of the ms=+1 level exists. (a) : X-Band EPR spectrum measured at 4K under 2.4eV laser excitation. (b) : Eneygy scheme representing the Zeeman levels od the NV (S=1) center as a function of the applied magnetic field. (c) : Intensity of the absorption (black) and emission (red) transitions, observed at room temperature at X-Band, as a function of the excitation energy. (d) : estimation of the spin polarization of the defect at room temperature and below 200K. Further detailed studies of the optical properties of the NV center in SiC are currently in progress at INSP and this work will be extended to other SiC S=1 defects.